I just saw this card celebrating Mother's Day today. 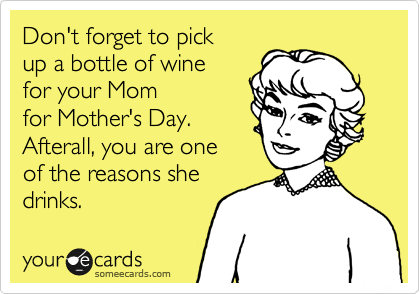 You know, because I love wine, and I love being a mom, and sometimes they do make me want to pour a beverage. But I immediately thought of the famous and awesome whiskey speech by Soggy Sweat. When I was a small child, my father began holding it up to me as one of the most brilliant moments of rhetoric in the modern west, and he was, as per usual, correct in doing so. I remember the speech always - about adult beverages and about most things. And children are one of those most things. Because, as a mother, I daily give up my everything and die for them - and at the same time, I find my glory, my joy, my everything in them. We do this first with our spouses, but with our children it is even more profound. Like with whiskey, they both topple and cheer. And if you go a day without them doing both, well, you're likely doing something either wrong or way more right than I am. When God gives you your ultimate tool of sanctification, you better believe it will be awesome in all senses of the word, not just the newfangled ones. "If when you say whiskey you mean the oil of conversation, the philosophic wine, the ale that puts a song in their hearts and laughter on their lips, and the warm glow of contentment in their eyes; if you mean Christmas cheer; if you mean the stimulating drink that puts the skip in the old gentleman's step on a frosty, Christmas morning; if you mean the drink which enables a man to magnify his joy, and his happiness, and to forget, if only for a little while, life's great tragedies, and heartaches, and sorrows; if you mean that drink, the sale of which pours into our treasuries untold millions of dollars, which are used to provide tender care for our little crippled children, our blind, our deaf, our pitiful aged and infirm; to build highways and hospitals and schools, then certainly I am for it. My children are the reasons I drink. Sure. Definitely. But, I'm glad to say, most of the time, it is because they put a song in my heart, laughter on my lips, and the warm glow of contentment in my eyes. They are Christmas cheer, they provide way more than a skip in my steap. They magnify my job, my happiness, and allow me to forget, if for a while, life's great tragedies, heartaches and sorrows. Pour me up another. There is much to celebrate. Cheers to that, if nothing else. Menu 5.10.12 - Birthday Week!